Progressive bloggers have many admirable characteristics. They try to rely on real science, not junk science. They look for public policies that reduce suffering. But when it comes to government they often become slightly unhinged, adopting the sort of “faith-based” reasoning that they tend to deride in conservatives. Recently I’ve notice three blog posts by Greg Mankiw that (directly or indirectly) challenged progressive faith in big government. All were derided by progressive bloggers, but in each case Mankiw was clearly right. Part 1. In May 2010 Greg Mankiw reported some data on tax revenue per person in some big economies. From that data I’d guess that the US and European tax systems raise roughly equal amounts of revenue per person, even though US taxes are slightly less than 30% of GDP, and European taxes are closer to 40% of GDP. Mankiw didn’t even comment on the data, he merely reported it. But the post received all sorts of criticism, none of it valid. I’d go much farther than Mankiw. I’d argue that this data is strongly supportive of the view that both the US and Europe are near to tops of the Laffer Curve for total taxation. I did not say then, nor do I claim now, that we are precisely at the top. But I also don’t see any reason to believe that if we raised taxes from 28% to 40% of GDP, that revenue would rise anywhere near proportionately, with no change in GDP per capita. The progressive response is that the Laffer Curve idea is far-fetched, and that higher tax rates don’t reduce GDP per capita. Instead they argue that the lower European GDP/person represents mysterious cultural differences, a preference for leisure. Even worse, this cultural trait developed only recently, as during the 1960s (when French tax rates were similar to those in America), they worked just as hard as we did. All this may be true, but progressives can’t point to any European models (except perhaps special cases like Norway and Luxembourg) that raise the sort of revenue they claim the US would raise if we boosted taxes as a share of GDP to European levels. For instance, in Mankiw’s data the Germans raise $13,893/person with taxes of 40.6% of GDP. The US raises $13,097/person, with taxes of just 28.2% of GDP. The progressive denial of the Laffer Curve is an implied claim that if we raised our tax rate to German levels, our GDP would not decline, instead we’d raise an astounding $18,856/person in tax revenue, despite the fact that no other major country with Euro-style tax rates comes close to raising that kind of revenue. Quite a leap of faith. As I’ve long said, I think progressives do tend to overemphasize the importance of progressive taxation as opposed to adequate taxation. But people should have the facts. The rich pay a huge share of the total taxes in the United States because they have a huge share of the money. But these attacks were wrong, as anyone who has read the important work by Peter Lindert would immediately have known. Lindert showed that Europeans were able to raise more tax revenue only by having more regressive tax systems than the US, i.e. tax systems that relied more heavily on consumption taxes. This is now pretty much common knowledge in the public finance area. But many American progressives keep insisting that we can get closer to the (egalitarian) European model by making the US tax system more progressive, by having the rich pay more. There is a respectable counterargument to all this. The regressivity of European taxes is offset by the much greater progressivity of their social insurance programs. So the more thoughtful progressives (including Yglesias, and I’d guess DeLong) will often acknowledge that higher taxes on the middle class are also necessary, but then we can have a decent system of social insurance for the poor, plus high speed rail. The problem with this argument is that we’ve just seen that it is not at all clear that the US can raise all that much more revenue. If we raised our tax ratio to 40% of GDP, who’s to say we wouldn’t start working German-style hours? This is double trouble for progressives. Any attempt to raise more revenue will require much more regressive taxes, and that merely gets you a higher share of GDP, in absolute terms you probably wouldn’t raise much more revenue. Part 3: Progressives also seem to have excessive faith in fiscal stimulus, despite the fact that for decades our best macroeconomists have been saying that that fiscal stimulus is a bad idea. These progressives counter that fiscal stimulus is needed because the Fed can do no more at zero rates, even as the very same progressives bash the Fed for not doing lots more at zero rates. In March 2009 Greg Mankiw pointed out that the CEA growth projections for RGDP seemed to violate research showing a unit root in RGDP. The CEA forecast negative 1.2% growth in 2009, and then roughly 4% a year out to 2013. That’s a total of 15.6% RGDP growth between 2008 and 2013. Paul Krugman had a scathing attack, arguing that you’d expect above trend growth during the recovery. Greg Mankiw challenged Krugman to a bet, and Krugman refused. I have no problem with that, as I don’t do bets on macro outcomes (I believe in targeting the forecast, so there is nothing to bet on in my view. We immediately know all we need to know after policy initiatives.) Nevertheless, we are now about half way through that 5 year period, and it is pretty obvious that Mankiw’s going to be roughly correct; total RGDP growth during 2008-13 will come in way under 15.6%. For progressives, that was another triumph of hope over experience. [O]n the local level, it seems even conservatives have no real doubt that federal spending can create jobs. What about at the national level? Raised the level of inflation-adjusted gross domestic product by between 1.1 percent and 3.5 percent. Lowered the unemployment rate by between 0.7 percentage points and 1.9 percentage points. Increased the number of people employed by between 1.3 million and 3.5 million. Increased the number of full-time-equivalent jobs by 1.8 million to 5.0 million as additional workers moved from part-time to full-time work. I have a number of posts showing that Krugman, DeLong, Dean Baker, etc, all falsely claimed that evidence of regional growth after fiscal stimulus was evidence that the multiplier was greater than zero. Of course that’s engaging in the fallacy of composition. And what can one say about the CBO estimates? They plug numbers into a model that simply assumes fiscal stimulus works, and the model tells us that fiscal stimulus did in fact work. The modern macro models that were dubious of fiscal stimulus tended to assume central banks were engaged in inflation targeting, and hence would offset the fiscal stimulus. But these pro-stimulus studies typically assume no monetary offset, despite the fact that the Fed recently adopted QE2 precisely because inflation was falling below their comfort zone. Progressives believe that the US can raise lots more revenue, that the US tax system is not progressive enough, and that fiscal stimulus can work. Those are all examples of the triumph of faith over reason. Blind faith in government that can only lead to bad outcomes. PS. Recently I’ve been way too nice to Mankiw. Just to show he’s not bribing me, I’ll criticize him here for not being tougher on the Fed—not encouraging more unconventional stimulus. This entry was posted on March 26th, 2011 and is filed under Misc., Supply-side economics. You can follow any responses to this entry through the RSS 2.0 feed. You can leave a response or Trackback from your own site. With respect to DeLong, I’d say not. As I mentioned in the earlier post on this, several years ago when DeLong was decrying the lack of progressivity in our tax code, I pointed out that we had it in fact, if not in theory. That the post-Reagan tax code raised more from higher income people than previously. His response was that the definition of progressive taxation was, higher rates on higher incomes (aka, would I please stop confusing him with the facts). I was sorely tempted to ask him if he’d let his membership in the Reality Based Community lapse, but, since it was his blog, resisted. I wouldn’t worry too much about it. There are only so many battles that one can fight at one time. Once people see god they never doubt his face. The good news is that the welfare states cant even be content with their tremendous taxes and regulations. The bond markets will eventually have their day(sooner than many suspect) and competition for talent and capital is already becoming a binding constraint. Denmark already has huge problems retaining its young people as something like 20,000 college graduates net emigrate every year while in soviet Canada our administration is agressivley lowering corporate income tax rates despite a general ambivalence of the local populace to private enterprise. I can easily imagine a future where, like the previous exodus of the Russian intelligentsia, young people flock to countries of low taxes and good airports. Patrick, That’s unfortunate, as nothing could be more misleading than official tax rates. Honeyoak, That’s depressing, if the welfare state doesn’t work in Denmark, it won’t work anywhere. They have the highest level of civic trust in the world. Don’t all empirical models show the US to have extremely low tax effort. I mean, I have an ideological axe to grind in favor of cutting taxes, and when I ran a regression against the usual suspects, I got US having very low tax effort compared to Europe. I’m going to respond out of order. I was genuinely surprised by DeLong and Yglesias’ response to Mankiw’s post. It was very knee-jerk of them, and I thought this was conventional wisdom (thanks to Peter Lindert). 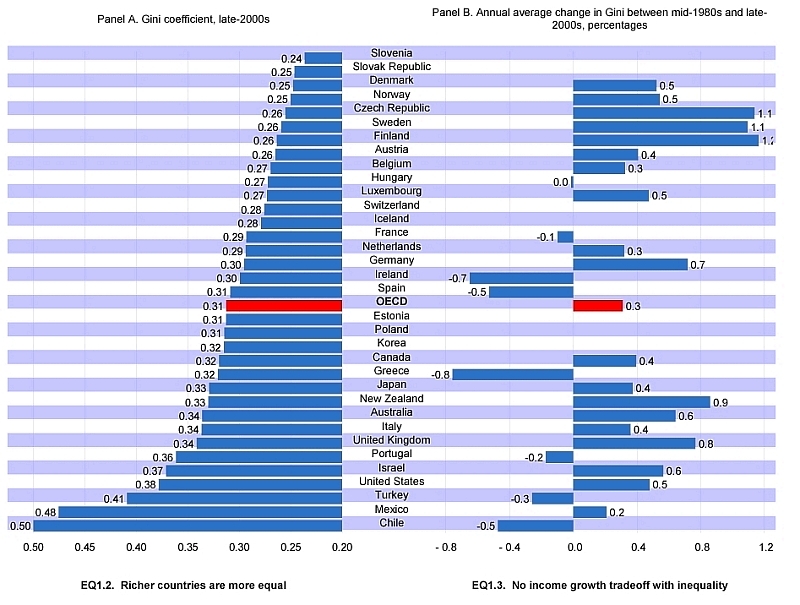 Mankiw was merely reporting the facts, and Peter Whiteford (the author of the study) has no axe to grind, and his comments here and elsewhere only support the basic conclusion that the US tax system is more progressive than most other OECD members even when one takes into account income distribution. The liquidity trap argument is the only one that makes the effectiveness of a fiscal stimulus plausible in an open economy with flexible exchnage rates. Once one disabuses oneself of its existence it’s hard to see how fiscal stimulus has any nominal effect given the central bank’s reaction function. “Well, back to the main question: if we adopted the “European model” would we end up with more tax revenue than we have now? Not if we did everything the “European model” entails: strong unions, higher minimum wages, more regulation, generous unemployment insurance, etc. just to use your examples. Europeans have a lot more liesure time than Americans and it’s not because they’re all trying to avoid paying taxes. However, let’s ask a more specific question: could we raise more tax revenue without impairing our GDP per capita? I think the answer is yes, if you keep marginal tax rates low (less deadweight losses), tax consumption (increased incentives for savings and investment) and tax labor instead of unearned income (the income elasticity of the supply of labor is practically zero for higher income people). Am I proposing that we increase taxes? No, I’m just posing and answering a related hypothetical question. Food for thought. Nothing in the past year has greatly changed my point of view. Even if one grants Edward Prescott’s 2004 paper on the effects of taxation on hours worked (very debatable in my opinion) I would suggest that it only implies the ultimate tax system would be a progressive consumption tax. There’s nothing magic about the $13,000-$14,000 level in per person taxes any more than there is any validity to Hauser’s Law. In short, I agree with you on two out of three points. Not bad given I tend to vote for “progressives”. Mankiw used to have a comment section; he closed it in 07 because he lacked time to moderate it. This week I have been contemplating what it is about Greg Mankiw that causes liberals to lose their minds. It’s not exactly like he’s a libertarian hero. 2. Last year, Mankiw wrote a NY Times piece making the extremely uncontroversial claim that people’s marginal decisions are affected by costs and benefits at the margin. “A recent study by Christina D. Romer and David H. Romer, then economists at the University of California, Berkeley, finds that a dollar of tax cuts raises the G.D.P. by about $3. According to the Romers, the multiplier for tax cuts is more than twice what Professor Ramey finds for spending increases. Mankiw’s a very smart guy. He knew it was such not really that big a puzzle. In order to explain why, let me temporarily put on my fiscal stimulus econometrics cap. To compare the fiscal multipliers estimated previously with Romer’s estimate was inappropriate. She used a very different methodology. For example, previous studies did not fully controlled for the tax increases that often accompany spending increases. Thus they were likely to understate the effects of spending increases alone. Valerie Ramey’s study in particular assessed the impact of the Korean-War military spending increase without taking account of the fact that it was accompanied by a large tax increase. What Romer’s study showed was not that tax cuts were uniquely effective, but rather that failing to consider the reasons for tax policy changes led to an underestimation of their effects. Because these issues of omitted variable bias were likely to be as strong for spending changes as for tax changes, the most reasonable interpretation of her paper was that all types of fiscal stimulus were more potent than conventional estimates would have led us to believe. More importantly consider that Mankiw’s NYT article was written in January 2009 during the debate concerning the fiscal stimulus. Not once in the entire article does Mankiw suggest that more monetary stimulus might be used in place of a fiscal stimulus. In short, that was not one of his better moments. P.S. I wonder what Romer would say about her paper today? Thanks, I hadn’t thought about that before. I’m certainly not qualified to argue about these papers, but I’d still be hesitant to apply the “intellectual dishonesty” charge to Mankiw. In “Identifying Government Spending Shocks” (2009), Ramey seems to accept and try to apply the Romers’ insight to spending, and comes up with similarly low multiplier estimates. So saying there is a “puzzle” is not indefensible. But I take your point that the Romers’ conclusion was that how you classify fiscal changes can make a big difference to your estimates, not that tax cuts are uniquely important. rhmurphy, Not sure what you mean by “tax effort.” We do collect less than most as a share of GDP. Mark, But where are the countries that collect $18,000 to $19,000, in tax revenue per person. david, Probably a wise move. William, Yes, I’ve seen progressives wildly overreact to Mankiw. It’s a theoretical construct. Put me in charge of public policy and I’ll “get-r-done”. If I recall, you are skeptical of the effectiveness of fiscal stimulus even apart from concerns about offsetting Fed policy. As a sloppy layman, it’s hard for me to get past the a priori idea that if you put money in the hands of those more willing to spend, you increase inflation and help a below-capacity economy. I think of the WW2 example, especially. Yes, I realize that fiscal policy may be vastly suboptimal compared to monetary policy, but ineffective? I just don’t understand the logic. There’s a lot of knee jerking about among progressives thinking wishfully. Here’s another example I just saw, amusing one in its way. Researchers showed people a chart of the wealth distribution for the US (top quintile 84%) and one for “Sweden” (top quintile 35%) — both clearly illustrated with nice big pie charts — and asked people which country they would rather live in. People said Sweden. And so the researchers reported in their paper. Noah at Slate, HuffPo, and the like picked this up ran off with “Americans actually live in Russia, although they think they live in Sweden”, etc, etc., and this is now a liberal meme of the moment making the rounds. Except Sweden’s wealth distribution actually is very much like the US’s, believe it or not. The researchers had made up the numbers for the comparison country and decided to call it “Sweden”. (Even more disingenuously than it sounds when you read the details). In their paper the researchers accurately reported what they had done, but one had to really read down in the details to gt to that, and why bother when the lede is presnted to you right at the top? So Noah, HuffPo et al didn’t bother once they had the story they wanted. Felix Salmon has the details along with the big pretty pie charts for the USA, “Sweden”, and Sweden. One would think that professional journalists would read the papers they write about, but it’s first things first, I guess. but the social insurance programs in europe are /NOT/ very progressive. They tend to help the rich more than the poor. BTW, that’s very “progressive” 🙂 of you to make that observation. I will be more general here and describe how European governments’ spending tends to be regressive. 1) I doubt I could find it now, one was a video from Reason magazine describing the social insurance programs in Scandinavian countries. A Swedish economist was describing that people basically get the money back that they put in. 2) Another is the observation that in the US, tax funded medical care is means tested for everyone except the elderly whereas in europe it generally isn’t means tested for anyone, and living in a wealthy area generally means access to better doctors. This is much like how one’s access to US state run primary and secondary schools mostly depends on where one lives. 3) Very high gasoline and vehicle taxes keep the poor off the roads (and on public transportation) so that the rich (who can afford the taxes easily) have access to less congested and better roads. Furthermore, the reliance of the poor on public transport makes it more difficult for them to work and conduct business far from a main public transport line. This further gives the rich a benefit over the poor. 4) Very high taxes on income but low-ish taxes on capital gains, corporate profits, and real property means that the rich have benefit over those who are trying to become rich, but are not yet rich. Remember income isn’t wealth, its the first time derivative of wealth. Items 1 and 2 confirm what you are saying but 3 and 4 refer to taxes which were not part of your initial premise. Nevertheless, thanks for the response. In some ways I feel the same way. But then I think about the fact that there are small countries much better governed than the US, and they can’t even “git er done.” Then I look at our Congress . . .
Mike, I’m not saying it can’t work at all for a given money supply. But remember that in that case the money you put in someone’s hands isn’t newly created, it is taken from someone else’s hands. So the effect may be weaker than common sense suggests. I’m certainly aware of the Keynesian argument that it can boost velocity, and even agree to a certain extent. It’s hard for me to explain my view, as if you buy into my definition of monetary policy (expected NGDP) then that issue can never really be separated out. Using my terminology, fiscal stimulus works if and only if it makes monetary policy more expansionary. The issue of whether it does that isn’t technical, it’s pure game theory. Jim Glass, I seem to recall data that wealth was actually more unequal in Sweden. Perhaps they estimated all those missing categories described in the article. I finally figured out why I like you so much. You’re my yin to your yang. You’re furiously trying to figure out the demand side issues whereas I’m furiously focused on the supply side. And yet, as you note, one must accept reality. The sad thing about economics as a “science” is that it is near impossible to run tests to set policy. 1. If we established a low ball progressive consumption tax system with say three brackets, and no loopholes. 3. Quit raising the tax rates the moment the % of GDP growth no longer was greater than the % of government revenue growth – when we knew the government did harm. Then we could stop arguing – and we’d have a political argument to allow no tax changes – this alone would be a big deal. It worked with Gramm-Rudman-Hollings- for a while. The hard thing is running experiments in *macro*. That being said, I’ve noticed you’ve been recieving some rather unsavory unsubstantiated comments in other blogs lately. I don’t support Brietbart by any means but some of the things you’ve written there are mild by my standards (your suggestion concerning corporate taxes for example). You seem like an ideameister but your approach is far too gonzo for my tastes. I’m merely crazy. Output per hour worked in France and the United States are almost exactly equal, there was a Blanchard paper about this. The difference in output is entirely attributable to labor input. Scott seems to engage in some pretty serious straw man construction when he writes, “Mankiw didn’t even comment on the data, he merely reported it. But the post received all sorts of criticism, none of it valid. I’d go much farther than Mankiw. I’d argue that this data is strongly supportive of the view that both the US and Europe are near to tops of the Laffer Curve for total taxation. I did not say then, nor do I claim now, that we are precisely at the top. But I also don’t see any reason to believe that if we raised taxes from 28% to 40% of GDP, that revenue would rise anywhere near proportionately, with no change in GDP per capita. I consider myself a liberal economics professor, and I regularly read work by DeLong and Krugman. I don’t think they’d agree with this characterization of liberal economists. I expect that liberals and conservatives do differ considerably in their guesses about exactly what the deadweight loss from taxation will be. We also probably differ in our guesses about where the Laffer curve kicks in. I find your claim that raising taxes wouldn’t raise much more government revenue to be absurd. Will we raise money less than proportionately? Yes. Will we create deadweight loss more than proportionately? Yes (though we _may_ be able to offset this partially by spending the money effectively and by reducing other sources of deadweight loss). Are higher taxes nonetheless worth it? Yes. I am not an expert and this is my rant. Doesn’t this in some why point to the problem in the US (and maybe the world) that no one is no longer viewed as credible. And they are not credible because why? Because supposedly they represent a fringe group that in its self is not credible so it somehow discounts a persons actual life long knowledge? So in the publics eyes these intellectuals are perceived as ice skating queens all whacking each other in the knee for the top spot on the podium. None credible, clearly not knowledgeable (just ask their peers), a profession in total disarray. And as a society lost and thirsting for answers and not ice queens the unintended consequences are we turn to self proclaimed experts like Beck, Paul, Cavuto and the rambling of countless others who know nothing about economics and are spouting ideas that are truly self serving. So what is the disagreement? Is it in taxes or faith in government? Economics or ego? The US has 10% unemployment. 350 banks have been closed since the start of the financial crisis. The middle class in the US is under stress. And what has the economic profession done? Has it mobilized its vast resources to help the general public understand the issues via robust debate? Has it unified and provided guidance and clarity to policies for our politicians to enact? Mark, Do we really have to accept reality? Morgan, We could do experiments with predictions markets, but the government probably doesn’t want to know the answer. This is completely inconsistent with your previous straw man argument. I claim people like DeLong and Krugman disagree with this, and you say I am setting up a strawman. Then when I say I believe this, you say it’s absurd. Which is it? The facts are that the US has taxes of about 28% of GDP and Germany has taxes of over 40% of GDP. Yet both countries raise in the $13,000 to $14,000 range in taxes per person. I may be wrong, but I can’t see how someone could argue my view is “absurd.” Are the German workers inferior to Americans in some way that I have overlooked? Or just overtaxed? Dan, I’m trying my best. Maybe not. I think I may have just performed a bloody monetary miracle. I convinced “anne”, a well known hard-left-wing-data-phile over at Mark Thoma’s Economist’s View to give QE (and more QE and the importance of the open FOMC seats) the benefit of the doubt. Glory Hallelujah! If I have the power to convince even her, all is not lost. But please no one say anything to offend her. I consider this to be possibly a major breakthrough on the econblog left. Mark, Keep up the good work. This entire post reveals the writer as not understanding Monetary Sovereignty. There is a diametric difference between Monetarily Sovereign nations (the U.S., Canada, China, Japan, Australia et al) and the PIIGS. Monetarily Sovereign nations have no need for taxes to support spending. In the U.S., for instance, all federal taxes could be reduced to zero, and this would not reduce by even one dollar the federal government’s ability to spend. Taxes to reduces the money supply, and so are anti-growth, and under certain circumstances, anti-inflation. In short, taxpayers do not pay for federal spending. By contrast, monetarily non-sovereign governments (for instance, the U.S. states, counties and cities), do rely on taxes for spending money. There, taxpayers do pay for government spending. Not understanding the difference between Monetarily Sovereign and monetarily non-sovereign leads to nonsensical comparisons of euro nations with the U.S. Such lack of understanding also leads to nonsensical speculation about how much tax the federal government “should” collect, and of course the entire debt ceiling debate is base on not understanding Monetary Sovereignty. Most of the people doing the shouting think federal finance is similar to personal finance, and use the same criteria to evaluate each. Anne was a decent debater. I´ll buy you a beer if you manage to get anywhre with “Godilocksisableacblonde”. I debated him and he called me a “forgerer”! Rodger, Sorry, but I have no idea as to what you are talking about. It’s called mandatory paid vacation. Nothing mysterious about it. It is next to impossible for a Frenchman or a German to work considerably more hours for his employer. The only practical options are self-employment and the grey economy. It is designed to be difficult. That’s the point, otherwise it wouldn’t have the desired effect. One need not be a progressive to find the Laffer Curve fishy, btw. There are three qualifiers I would mention when discussing Part 1. First, “big economies” and “major countries” I am guessing disqualifies Sweden who would, according to Mankiw’s calculation, raise $17,700/person or the Netherlands who raise $16,200/person. This isn’t $18,856/person but it’s much more then $13,893/person. Second, all these calculations are done using PPP adjusted GDP numbers. This is fine as far as it goes, but PPP data reflect differences in consumption taxes (I think) which are generally higher in Europe than in the US. Using nominal GDP will of course show huge disparities (for instance in nominal terms the numbers above become: Sweden $20,500/person, Germany $16,510/person, US $13,000/person). So, while PPP is probably the best we can do to compare apples to apples, it is still not very exact. Third, 0.282 is a low water mark for government revenue in the US. It hasn’t dipped below 30% since the 1970s and has been as high as 36%. Doing Mankiws calculation for the US in 2007 (PPP) shows the US raising $15,400/person. Now you might say this was a special year, but I would say it is closer to typical then the 2009 figures Mankiw uses. Other then that, great post. I hope you return to blogging invigorated. You are confusing cause and effect. Why do you think these policy changes were made in France but not America or Japan? And lots of Americans work second jobs. And your argument doesn’t explain the high natural rate of unemployment in France, nor earlier retirement, nor more youth unemployment. Nor why things have changed since the 1960s. Supply-side models explain all of that. “There are three qualifiers I would mention when discussing Part 1. I should someday do a post on this. When comparing two large continental size economies, it makes sense to either compare totals totals, or most succesful parts to most successful parts. I’m fine with either. I think Massachusetts or NYC or the SF Bay area of California could raise $18,000 per capita. I don’t think Mississippi or the border region of Texas could raise even $13,000. The same is true for Western Europe. Overall they collect about as much tax revenue as we do (per capita), but they do so with much higher taxes as a share of GDP. That is interesting. I’d guess the same is also true when comparing the most economically successful areas of each continent. I don’t know enough about your second point to comment–you might be right. Regarding 2009, didn’t European taxes also fall? Their NGDP fell more than ours. On the other hand our tax system is more progressive, so I think the figures are biased somewhat, as you suggest. On the other, other hand that bias strengthens Mankiw’s argument, as it suggests US revenue is usually higher. Still, when all is said and done I think Mankiw’s on to something. Most estimates show European GDP in PPP terms as being 20% to 25% below the US. And certainly their tax rates as a share of GDP are considerably higher. I’d guess total revenue in the two regions isn’t all that different, although Mankiw’s exact numbers would be modified. This is what leads me to believe that the PPP adjustments are not going to be adequate when comparing taxes between US and Europe. I think someone (with lots of free time on there hands) could probably pull out the consumption taxes from Mankiws calculation to try and get a better apples to apples comparison but this is getting to involved for me (I am not an economist, I’m a chemist). Anyway, thanks for responding. Hope the “spend more time with my family” plan is working out for you. Claron, All good points. I agree the PPP numbers are highly imprecise, but would add that I am pretty sure that the hours worked estimates tell a similar story. I recall reading that the Germans and French work much shorter hours than Americans (prior to this recession.) Indeed I think it’s roughly 20% to 25% less when everything is taken into account (work week, vacations, second jobs, early retirement, youth unemployment, disability, etc.) If so, then much of the revenue gain from higher taxes is lost due to less hours worked. Maybe not 100%, but a substantial share. We already raise a lot of revenue, we just don’t spend it wisely. For instance, I believe that our government spends about as much as the Canadian government on health care (per capita). The difference is that with that money they cover everyone, and we cover much less than 50% of the population with government health programs. We are also near the top of the world in spending on education–but our k-12 system has big problems. Given the two data points you mention, isn’t is reasonable to assume that the US should raise tax rate to get to the true maximum? If 28% and 40% generate about the same amount of revenue, the optimum is likely to be somewhere in the middle… I would think it’s difficult to argue that the relationship could have multiple maxima, which implies lowering tax rates will do you little good from a deficit reduction point of view. Maybe your argument is that it would make little damage as well? I do agree however, that the data supports the notion that we aren’t yet at the top, and hence the extreme supply-siders tend to overstate things. Like Mankiw, I am a moderate supply-sider, who thinks the effects may be more important than progressives realize, but also thinks that at current US rates, revenue would usually rise with moderately higher tax rates. I don’t see why it would have an infinite cost. You are “just” forcing people to consume more leisure (or not measured production e.g. cutting your own lawn)… Surely leisure has a value, so even if GDP goes down, “utility” is not much changed. I doubt that any small shift in labor/leisure allocation would have a massive impact on personal welfare. Am i missing something? A Carraro, Think of the marginal cost as a ratio. the numerator is the deadweight cost of a small increase in the tax rate. That will be fairly stable and positive near the top of the Laffer Curve. The denominator is the increase in tax revenue, which will approach zero near the top of the curve. Thus the ratio approaches infinity. This is true regardless of tax evasion, or unmeasured value of leisure, etc. Any businessman will tell you that all business revenue, obtained directly or indirectly in the supply chain, comes from real individuals: the end consumers. All the taxes incurred in that chain, including payroll taxes, personal income taxes, business taxes, sales taxes, VAT, etc. are financed only by consumer purchases, there is no other source of income to pay taxes. Pay As You Earn Income Tax (PAYE) takes the tax before you have the money in your pocket, because it is effectively a sales tax on top of the price that you sell your working time, and as such the true value of your work is just your take home pay. The money forwarded to the Treasury is definitely taken from money ultimately paid by consumers and payment of personal tax begins when you spend your take home pay as a consumer yourself. Employees neither earn what they think nor are taxed what they think. No wonder governments over spend when the average voter considers that most taxation falls on someone else or should do. With his disposable income the employee buys goods and services that contain the very same tax rates that have been charged against his own work. Thus, real taxation begins with consumption and every consumer rich or poor pays the same rates. The more the consumer spends the more tax he pays. Does income tax provide social transformation by redistribution of wealth or is it just a deceit to help certain politicians gain power, while concealing the really horrendous burden of taxation for us all? That voters are so misled is the greatest corruption of our democracy! The continuance of any form of income tax is an anathema. Edward, I agree that taxes should be much more transparent, and I also believe that so-called progressive taxes are often anything but progressive. But I do favor a progressive consumption tax. Scott, I am very grateful for and highly value your remarks. As you know Value Added Tax in Europe is the principal consumption tax, mainly preferred to deter tax evasion. However, food for example already VAT exempted and supposedly tax free, could be cheaper still under a single consumption tax scheme, because then automatically the whole supply chain for food would be exempted of any taxes. Also, exports are usually free of VAT and in this case export prices, becomng entirely tax free, would receive a massive competitive boost. The first country to adopt this scheme will not look back. Edward, The export case is often misunderstood. Countries with VATs don’t tax exports, but this actually doesn’t give exports any boost, as imports must pay the VAT. The combined effects of taxing imports but not exports will boost the exchange rate by the amount of the VAT, thus offsetting any advantage to exports. This isn’t just my view, but is 100% accepted by all trade economists. It would be more accurate to say that exports are not penalized by the VAT. Yglesias linked to another Lane Kenworthy post plotting hours worked and taxes as a percent of GDP. I think this measure more directly supports your observation about taxes and hours worked, but (as Lane and Matt observe) taxes don’t seem to tell the whole story. Claron, That sounds about right. * So we know for a FACT that Europe taxes more as a proportion of GDP, right? * We also know that the US has a higher GDP, right? So how could we not take in more revenue given these two fact? Oh yeah, we might all work German hours (*gasp* no, not less toil). Do you really think the economy would contract that much so as to DECRESE revenue? Really? Really? One more time: really? Now who is giving into blind faith? Seems like one could make the argument that we *SHOULD* be EVEN MORE progressive. And clearly, just looking at how progressive we are now doesn’t prove anything. (Oh America is the least racist of tall the countries, oh, well I guess we don’t have to work on racism in America anymore, that’s sound logic.) Now who’s following ‘blind faith’? The fact is that Mankiw was right and Krugman was wrong about trend output. Almost everyone now agrees we won’t get back to trend. When Europeans claim that we should adopt the European tax model, the burden of proof is on them to explain why it won’t fail in America as it failed in Europe. Why don’t they collect lots more revenue that we do? One hypothesis is the supply-side argument. I don’t see the progressives even having a hypothesis, just blind faith. You can’t beat something with nothing. Am I reading this right: most economists, including Scott, think GDP won’t return to trend?